Beloved we cannot learn the gifts of the Spirit. It is beyond insulting to God to even infer that we can. This verse makes it abundantly clear that God decides. That the Holy Spirit determines how to give out His own gifts for the purposes of building up the church. Not building it with carnal metrics of how many people come to a church facility but rather that we are built up in the Gospel of Jesus Christ. That we would become mature as believers and increasingly grow in the knowledge of Christ. This is what our key verses teach us. Through these leadership roles, the church is supposed to mature. Not in our experiences but in His. Unity of faith is in the knowledge of Jesus Christ not what we think we experience in Him. What is interesting is the purpose outlined here is so the believer would not be tossed to and fro with every new wave of doctrine that comes along. To be able to discern the human cunning, craftiness and deceitful schemes of people like Darren Wilson. Now, Darren Wilson is not a typical teacher in that he does not preach. He makes movies. Unbelievably heretical movies that is. He uses the medium of cinema to scatter people away from Jesus Christ and towards this false god that he worships. The one that dazzles and wows us with tricks and gimmicks like glory clouds, gold dust and gem stones. Maybe some alleged angel feathers falling from the ventilation ducts or as he explained in one of his movies -- gold fillings suddenly appearing in the mouths of people who did not have them before. If you are wondering where in the Bible there are glory clouds, gem stones and 24 carat teeth you can stop wondering. They aren't there. That is the point. Darren Wilson does not care if any of his beliefs or movies actually line up with the Holy Word. That is the true danger of experiential Christianity. It takes the boundaries off that the Bible provides and replaces them with what we feel. Yet we know our hearts are wickedly deceptive above all things! Seemingly the only defense Wilson can offer for all of the unbiblical nonsense he promotes is that God "could" do it. Well of course He could but why would He? Why would He violate Himself? We know from the Bible that He cannot deny Himself. He cannot contradict Himself. So then we are left with an important question. Do we believe our own lying heart and the lying heart of Darren Wilson or do we believe in what God has already said? His two recent movies were entitled "Holy Ghost" as Wilson pretended that he allowed God to direct his own documentary. I reviewed the first installment and it was a tour de force of humanistic tricks, lying gimmicks and an exercise in discarding the Bible all blamed on a move of the Holy Spirit. In the first movie, Wilson films two would-be evangelists roaming the streets of Utah looking for people to prey on. Not pray for, prey on. Using fake psychic and false medium techniques they faked words of knowledge. So they would approach someone and like a mentalist they would start throwing as much information out as possible until they see a reaction in the victim. Then they seize on it pretending to have been given the information by the Spirit. Eventually they would move on to discussing what ailments the person might be suffering from, guaranteeing them healing from God. Using the power of suggesting they would start "praying" while asking if they were feeling anything change or get warmer. Once the poor person replied positively they jumped on it. "See that's God!" Then they would shout out something absurd like "double it", as if they were commanding the Spirit of God to step up His healing efforts. It was quite despicable to behold this misrepresentation of God being perpetrated upon the lost. Another infamous part of the first movie is the alleged conversion of lead man Brian Head Welch of the Satanic band Korn. 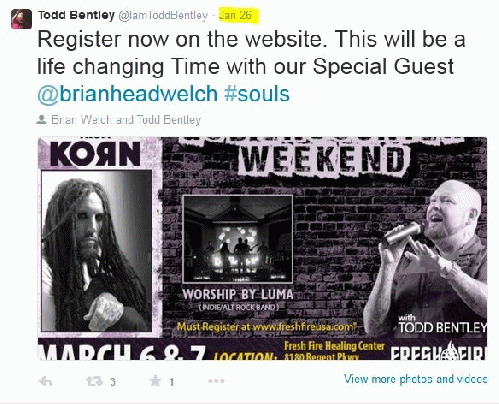 At the time of the movie, Welch claimed to have left the band but since, Welch returned to Korn and the lyrics on the album that followed the Holy Ghost movie were just as horrifically unchristian as they were before. During the movie however there was a scene where false revivalist Todd White was in the lobby of the Korn concert employing the leg extension trick that so many false healers utilize. This is where someone claims that they have one leg longer than the other and White claims he will pray over it and God will grow back the shorter leg. Because the length difference is so negligible, White uses typical sleight of hand to give the illusion that the leg is being grown out. If Todd White has such fantastic healing gifts why doesn't he visit a cancer ward? Because he is a fraud and a charlatan, selling Jesus for person profit. Some of the most influential Christian films of our generation? Wow, now that is an ego to contend with. The truth is these are some of the most heretical movies of this or any generation. Yet Wilson promises to teach you "how to partner with God and how to film God in a wide variety of settings. Wow again. It must be great to have God on your payroll and at your disposal. Wilson calls himself someone who has made a career out of filming God in the real world. Unfortunately, what he meant is filming a false God in the real world. He is right though. He has made a career out of this. He has made a lot of money selling a false god to people. He has used deceptive practices and outright fraud to perpetrate his lies. God does not use magic tricks. He does not use the fake leg growing scam or psychic games and mentalism. We do not have the power to command the Holy Spirit to "double it," whatever that is supposed to mean. Likewise, we cannot be taught the gifts of the Spirit any more than we can learn how to partner with God in filming Him. There are no gold dust, gem stone, or angel feather signs and wonders. There is nothing of God that leaves His Word behind. Darren Wilson is a false teacher and a charlatan. There is no going into business with God. He is not your partner. He is your Lord or He is your nothing. If you want to hear from Him -- read your Bible. If you want to see Him on film, record yourself reading the Bible out loud. There; I just saved you two thousand dollars.